In its first four games, Miami’s goals against totals were seven, two, two and one. The natural progression was a shutout. Senior Ryan McKay stopped 26 shots, including 14 in the third period as the RedHawks blanked St. Lawrence, 1-0 at Appleton Arena on Friday. It was the third straight win for No. 15 Miami, and it extends the team’s unbeaten streak to four games. After a scoreless first period, RedHawks freshman forward Jack Roslovic whipped a backhand pass from senior forward Sean Kuraly into the net 4:52 into the middle frame for the game’s only goal on the power play. Miami (3-1-1) held the Saints (3-2) to just two shots in that stanza. The RedHawks had to kill five penalties in the third period, including over a minute of 5-on-3 time. 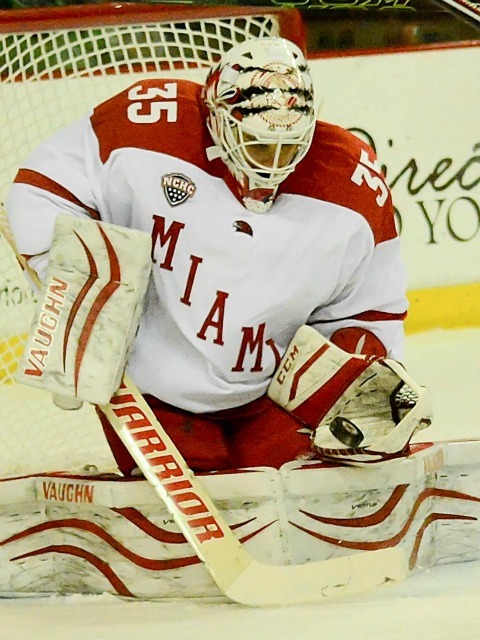 The shutout for McKay was the ninth of his career, as he ranks fourth all-time at Miami for his career. He has allowed just five goals in four starts this season. Roslovic has four goals in five games to open his tenure in Oxford, and he has all three of the RedHawks’ game winners. The assist for Kuraly was his first point of 2015-16. Miami improves to 2-0 on the road this season, with both wins coming by a goal. Both teams had seven power plays. The RedHawks were 1-for-7, giving them three goals on the man advantage in two games. St. Lawrence was 0-for-7, as Miami has gone three consecutive games without allowing a PPG. The RedHawks have killed all 14 man-advantage chances during their winning streak and are 22 of 23 for the season. The teams finish their two-game series at 7 p.m. on Saturday. Posted on October 24, 2015, in 2015-16, Ryan McKay and tagged jack roslovic, Miami RedHawks, Ryan McKay, Sean Kuraly, St. Lawrence Saints. Bookmark the permalink. Leave a comment.